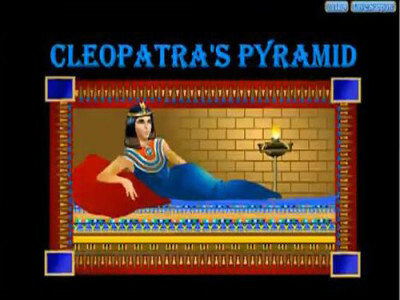 Cleopatra’s Pyramid Slots is a 5 reel, 20 payline video slot machine with, of course, an Egyptian theme. The slots game includes the typical features, like the bonus game and free spins. The betting structure will be familiar to many who play these slots. The minimum bet is one cent and the maximum is ten dollars. Like most Vegas Technology video slot machines, Cleopatra’s Pyramid has a “stop spin” feature that can be used as soon as the first reel stops spinning. The high-value playing cards are featured as diamond-studded letters and numbers, and they make up the lower winning combinations, along with the golden Tutankhamun Mummy sarcophagus. Wild Symbol: Cleopatra. The Cleopatra symbol can substitute for any other symbols, except the Scarab (scatter symbol) and Pyramid (bonus game). Multiplierr: When Cleopatra’s symbol is part of a winning combination, the prize is doubled. Jackpot: Get five Cleopatra symbols on a single payline for a jackpot of 10,000 coins. Scatter Symbol: Scarab. The Scarab symbol will enable a winning combination as long as there are at least two showing on any reel. The win is multiplied by the total wager and is paid independently of any selected paylines. Free Spins: Three or more Scarab symbols give a win of fifteen free spins. During free spins, all winning combinations are tripled in value. Bonus Game: When Pyramid symbols come up on reels 2 and 4 at the same time, the bonus game is activated. In this game, players select blocks and win a prize for each. Be wary of the cobra hiding in the blocks; if you find it you will be busted.